Hubby and I drove to Texas for a pre-Christmas visit with our daughter and family. Following a hunch, I googled “quilt shops in Texas” to see if there was one along our route. Common Threads Quilting in Waxahachie looked the most promising, and it did not disappoint. If you like Civil War and/or 1930s repro fabric, you will feel right at home in this shop. They have it all – from cheddar to shirtings to the latest repro releases. The tall ceilings facilitate the hanging of many samples for kits the shop assembles. The Cottontail Meadow block of the month caught my eye. Isn’t it precious? The staff is knowledgeable and friendly. And all the colors, fabrics, and samples combine to inspire! I was happy to hear that most of their merchandise is also offered online! Should you stop by Common Threads Quilting, you might plan an additional hour in your shopping trip for browsing in the nearby antique malls as I did. 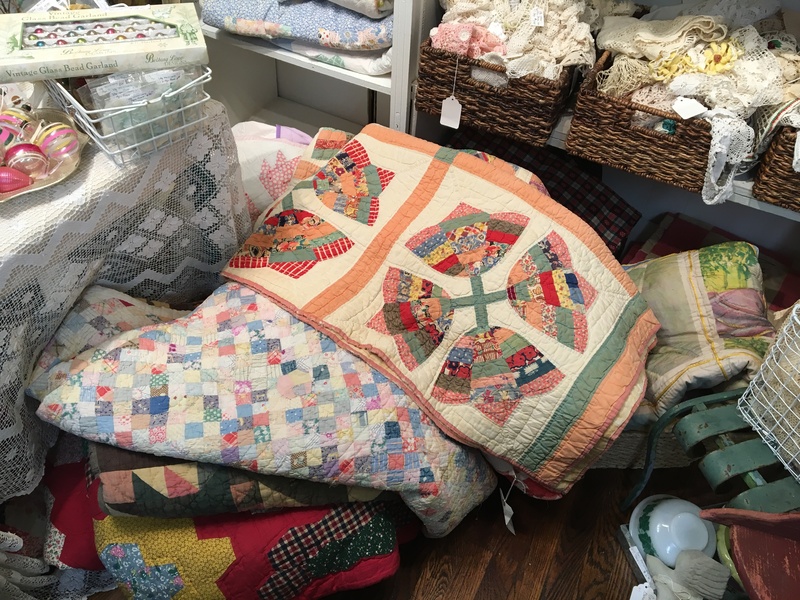 Besides admiring vintage furniture, glassware, jewelry, and memorabilia, I spotted a pile of quilts. The string pieced tulip quilt is my favorite! Thanks, Waxahachie, for an enjoyable afternoon! 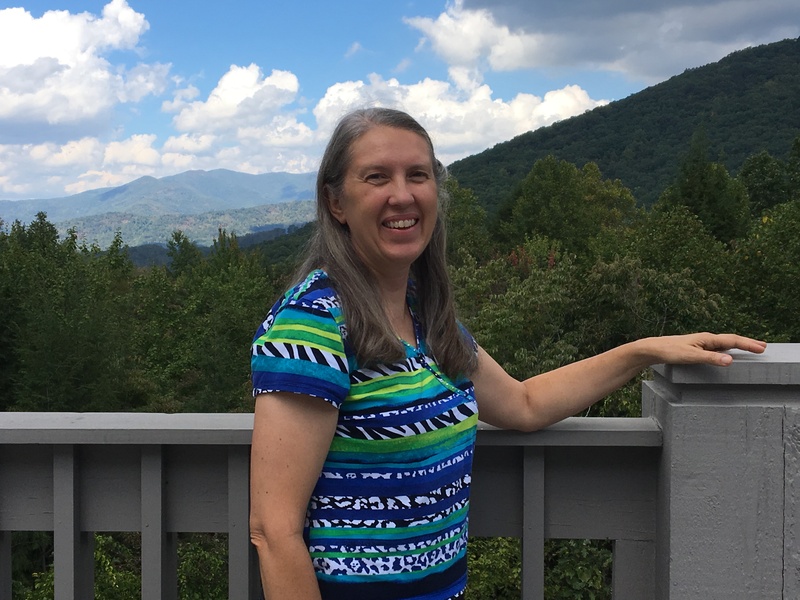 Last week hubby and I attended a retreat for Cadence International missionaries at The Cove in Asheville, NC. We were really blessed to hear the stories of three couples in their golden years who served with the mission since shortly after WWII. In addition, the accommodations at the Billy Graham Training Center are top notch. The meals, served buffet style, are delicious with unique recipes (like bleu cheese bread pudding), and the scenery in the Blue Ridge Mountains is beautifully restful. As you can see, we visited a couple of weeks ahead of the fall foliage colors. Free time was scheduled for Tuesday and Wednesday afternoons. Four of us ladies headed downtown: first to a shoe store and then to a quilt shop. Asheville Cotton Company & Bernina Center on Hendersonville Road boasts a LOT of fabric! It was delightful to wander among the rows and rows of shelved fabric and imagine all the quilts that could be made. Thanksgiving and Christmas, juvenile, Kaffe Fassett, brights, Civil War, blenders–it is all there. Of course we perused the sale table and admired the quilt samples. If your travels take you to western North Carolina, I recommend visiting this shop. On Wednesday afternoon, several of us drove to the Southern Highland Craft Guild Folk Art Center, a gallery and gift shop on the Blue Ridge Parkway. We were amazed at the items painstakingly crafted by talented artisans. Photos are not allowed, so be sure to click here to travel to the website and view the beautiful quilts, sculpture, glass, furniture, paintings, etc. We topped off free time by walking in downtown Asheville to a coffee shop, admiring the beautiful brick buildings as we strolled. 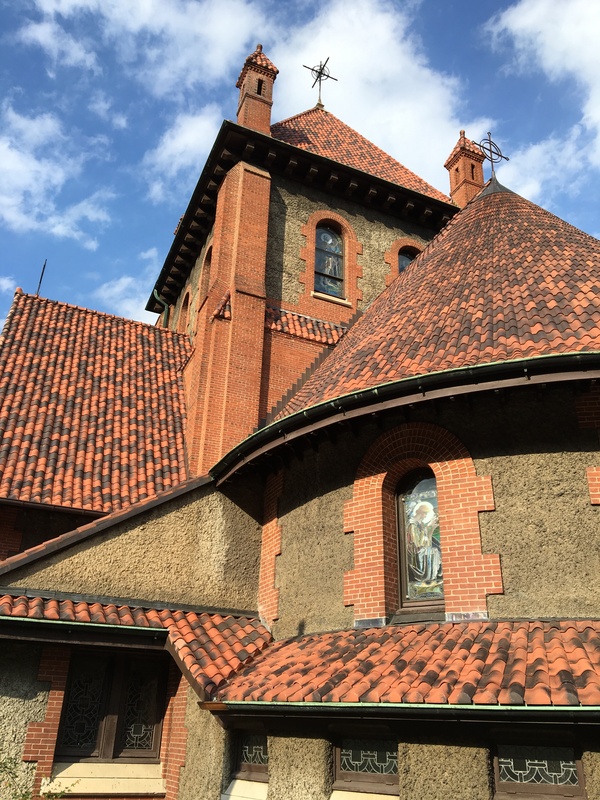 The Episcopal Cathedral offered interesting architectural photographic perspectives. Mountain scenery, comfortable accommodations at The Cove, a well-fortified quilt shop, relaxing coffee shops, and inspiring artwork at the Folk Art Center all made for delightful ramblings in Asheville. Last week I visited my friends, the Tuckers, who live in a small town south of Indianapolis, IN. Julia felt that Friday would be the optimum day to visit Quilts Plus in north Indianapolis. But I was loathe to ask her three children (ages 2, 3, and 5) to ride 45 minutes in the car, and then to “be good” in a fabric store while I browsed, and then to ride 45 minutes home. So we planned some fun activities for them in the morning like picking apples and pumpkins at an orchard, and playing on the playground, and exploring the old train station turned convention center and hotel in downtown Indy, and having lunch at P. F. Chang’s. We wound up at Quilts Plus in the early afternoon. What a wonderful shop, chock full of fabrics, books, patterns, kits, and samples! Of course, I was drawn to the Civil War repro fabrics . . . their stock of shirtings is phenomenal, and I also spotted newly released collections in favorite, rich prints. In addition, there’s a wool corner with exquisite samples. Quilts Plus offers juvenile prints and bright, contemporary lines as well. I purchased a “For You” Jelly Roll with coordinating yardage. I can’t wait to unroll it and begin sewing the project that’s been percolating in my brain. If your travels take you to Indianapolis, be sure to plan a side trip to Quilts Plus, 1748 East 86th St., Indianapolis, IN 46240. Check out their website www.quiltsplus.com and facebook page. The friendly clerks are happy to mail order, too. After our inspiring tour of The National Quilt Museum last Tuesday, Kathy drove Marie, Alicia and me to Eleanor Burns’ Quilt in a Day shop. You would think we would have had enough of viewing quilts and fabrics for one day, but nooooo, we needed some retail therapy to help us process all we’d seen in the museum. Eleanor’s shop has patterns, rulers, fabric, and quilters’ goodies for sale, and many samples of her quilt designs hang high on the walls. Incidentally, the Quilt in a Day 2015 Row by Row design featured penguins on skis! By wandering through the “sale” area, I found several prints to add to my stash, and I picked up a ruler for making the diamond design on the folded quilt pictured below. Next stop, Hancocks of Paducah. They’ve mailed me full-color, glossy catalogs of premium quilting fabric for years, so it was exciting to actually visit the store. Click here to see photos of the store interior and here for the home page. The bolts of fabric are organized by manufacturer and collection. While we shopped, we noticed employees scurrying about with shopping carts, collecting the bolts needed to fill customer mail orders. I found several batiks I need for current projects, a stack of Civil War shirtings I need for future projects, and an impulse purchase of two Charm Packs and a Jelly Roll. We also stepped into the warehouse portion of the store where pre-cuts are shelved and labeled for easy order-filling. Hancocks’ 2015 Row by Row design was four umbrellas on a rain-drenched background. On one hand, I wish I lived in Paducah right next to the fabric shop with all that textile inspiration at my fingertips; on the other hand, living there would severely jeopardize the family budget! On Saturday, Sept. 12, I taught a workshop for the Devine Quilters of Columbia, SC. The venue was Pieces and Patches quilt shop in Lexington. What a welcoming store with a comfortable, brightly lit classroom and varied collection of fabrics! The shelves boasted SC team prints, Christmas, blenders, patriotic, batiks, juvenile, prints in modern colorways, and some reproductions. 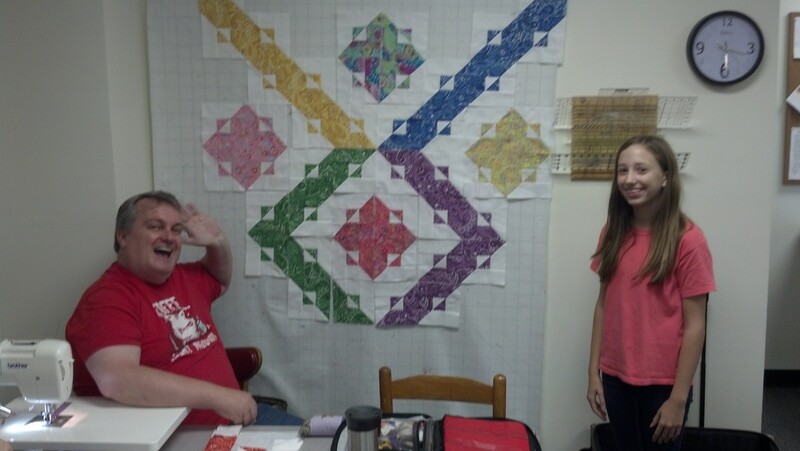 Donna, the workshop coordinator, selected “Get the Point?” designed by Carrie Nelson for Quiltmaker’s 100 Blocks, vol. 3. Since I teach my own construction method using an Easy Angle triangle ruler, quilters may use pre-cut 2 1/2″ wide strips (Jelly Rolls). Participants made great progress as you can see from the photos below. The classroom’s design wall, situated behind Mike, served to show several layout options. I hope the quilters each bring sample blocks to show at tonight’s meeting (7 p.m. Shandon Presbyterian, Columbia, SC), and I can’t wait to see pictures of the finished quilt tops. To read Stephanie’s creative interpretation of the workshop and to see more pictures, click here to travel to the Devine Quilters’ blogspot. There we were, barreling down I-20, enroute from Dallas, Texas to Tallasee, Alabama, the longest driving day of our return trip home. While hubby drove, I browsed the internet for “Quilt Shops in Louisiana.” I came upon a concise, alphabetical list by city. Determining that we would reach Monroe about the time we’d need to refuel, I compared my atlas with the online maps and descriptions of the quilt shops. I ascertained that Monroe is a sizeable city with at least three shops, none of which seemed particularly easy off/on the interstate. So I set my sights on Ruston, a smaller town with a shop just a mile off I-20. Hubby agreed we could use a stretch break, so we navigated to The Fabric Shop at 100 W. Park Ave. in Ruston. Ran chatted with the owner’s husband while I surveyed the fabrics and quilt samples. Besides some dressmaking and Louisiana team prints, the store boasts lots of juvenile prints, several rows of bright prints and batiks, some Civil War reproduction prints, some pre-cuts, and a Noah’s Ark row for this year’s Row by Row experience. Hubby and I were both glad we spent our morning stretch break in The Fabric Shop! What about you? Have you taken a stretch break at a quilt shop while traveling this summer? “Fabric Acquisition” – meaning Trinity and I are exploring some area quilt shops. A planned trip to Waco, TX for Keith’s orthodontic appointment prompted an internet search for Texas quilt shops participating in the Row by Row Experience. Lo and behold, Tomorrow’s Quilts is at 800 Lake Air Dr. in Waco! Please take a look at their home page to view their row for the Row by Row Experience. This summer, each participating quilt shop designed a 9″ x 36″ row with a “water” theme. Tomorrow’s Quilts’ row is four Sunbonnet Sues beneath umbrellas with raindrop background fabric – really cute! In addition to picking up the free Row by Row pattern, we honed in on the shopping cart full of bargain fabric – 3 yds. for $10. In the photo below you can see the bundles I bought for backings as well as purple and yellow tone-on-tone staples, zoo animal print, and several fat quarters (for which I have a plan; more about the FQs in a future blog post). On Monday we celebrated the first day of school by driving to Hamilton (without the grands) to peruse the offerings of One More Stitch on N. Rice St. My find was backing for granddaughter Krystine’s scrappy Nine Patch and orange Snowball quilt in fall colors. The print of concentric squares is “Awesome,” an older fabric line by Sandy Gervais; it’s perfect for the quilt, don’t you think? An Electric Quilt sketch of the design plan is in the lower right corner. On Tuesday after lunch with long time friend and blog follower, Pam, we visited Sew and Quilt Store in Killeen. This shop is also participating in the Row by Row Experience. Isn’t their row filled with fun details? I purchased an orange/red tonal and a teal/white chevron to go with the fat quarters bought at Tomorrow’s Quilts. I’m off to Trinity’s sewing room to work on my latest quilting project!